Creating Sales Orders is one of the most exciting moments of your business! This is where you will begin to see all of the results of your hard work come together! Whether your customers call you, walk-in to your retail store or visit your Showroom/eCommerce store online, a Sales Order will be generated to show what items they want to buy from you. For all Sales Orders, you will manually enter them into Stitchex using the instructions in this document unless the orders are coming in through your eCommerce store. If they are coming in through your eCommerce store, those will automatically be fed into Stitchex by your customers. In general, a sale represents a single purchase transaction with a customer. Typically you will have one sale per customer per season. 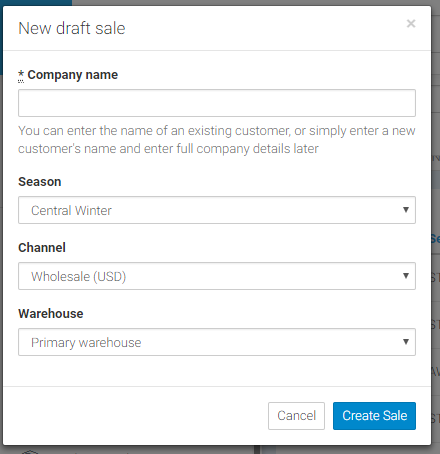 Sales created in Stitchex start their existence in the DRAFT state (even those coming in from your eCommerce store). And, you will have to "Confirm" the state before the sale is final. In this state, you will add products to build your tentative customer order. Type your customer's company name. If the customer is already setup in your company contacts database, a drop down list for you to select from will appear. If it is a new customer, you can update the contact information on the next screen. Status Area - Let's you see the status of your order as it progresses. For more information on how this works, please see the Manage the State of a Sales Order Knowledge Article. Contact Area - Let's you see the contact information for your customer. See our Manage your Customer Profiles for additional information. Order Area - Allows you to add products to your order. (You can also print other documents such as Line Sheets, Order Confirmations, manage discounts and more). Documents Area - Allows you to manage all documents related to your order including Shipments, Invoices, Returns and Credit Notes.